I think I discovered Lilla Rogers when I was in school. She represents some of the best of the best in this little field that I’m in. Lisa Congdon, Suzy Ultman, Jennifer Judd-McGee, and Helen Dardik are some of my favorites who she represents. She’s started teaching online classes I think a year or two ago to teach artists how to make art that art buyers are interested in. Secrets on how to get Anthropologie to call you! I knew a bunch of folks that I really respect taking it and I really liked some of the work that came out of there. They aren’t cheap classes and I wasn’t at a place where I could do it. She’s now offering a bootcamp class which is kinda get your feet wet and not as intense as the other online classes. I talked with Dave about it, because I have been feeling that my work was just not as good as it was in college. I spent countless hours refining and perfecting projects in school. I confess I have not been doing that since I got out of school. I haven’t had to present my work to my classmates and have them critique it. It’s been just Dave and me editing my work. It is tough for me being the only one that pushes me. I must admit it’s lonely at times working by myself. All that to say, I signed up for her bootcamp last Monday and it’s been awesome! 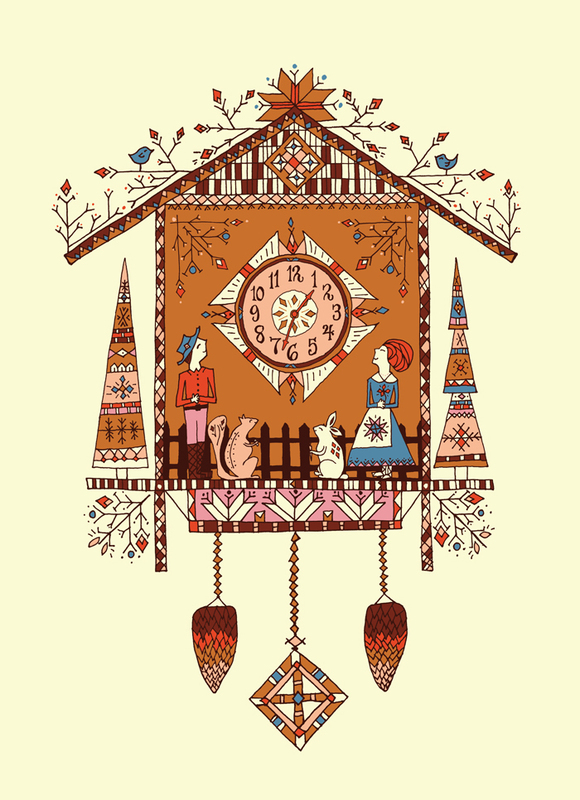 Last week we had to sketch cuckoo clocks. Here is where I started. 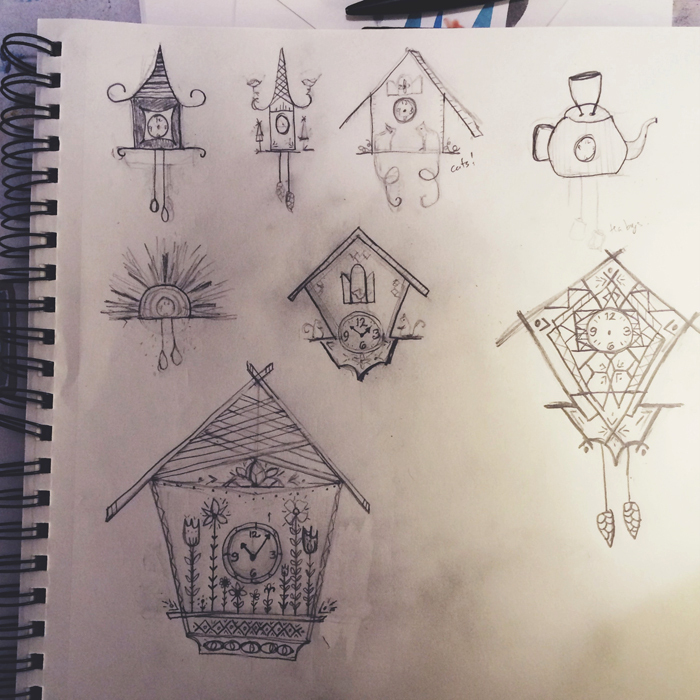 But I knew I wanted a lot of detail and I loved the geometry in the bottom right sketch. Below is my stack of sketches and final pieces to my big piece. I lack a lot of skills on drawing figures compared to my friend Tim. So there were a lot of animals that were meant to look like something but ended up looking like cats! Here is the final piece! I am so happy with how it turned out. It felt so good to spend over a week working on this. The more I kept going, the more questions I had to answer. What if I put people in it? Ooh trees would go great here! Should it be a fence or should it be a door. Windows or just little doodle decorations? What animals should I draw? Or should they be children? Do I need to put anything on the roof? I’m so glad to be taking the class and plan on taking the next two BIG classes that are coming up. The community is really encouraging and drives me to be better. One person in my class commented that she wanted my drawing made into a physical clock! And now I can’t stop thinking about making that happen! I know it would be crazy expensive for me to manufacture. But maybe someone like Land of Nod would see this and get that notion! 😉 I’ll keep updating my blog with more new work and hope you enjoyed reading the process!